"horse is a horse, of course, of course." But you've never, ever seen a horse like Linus the long-maned horse. 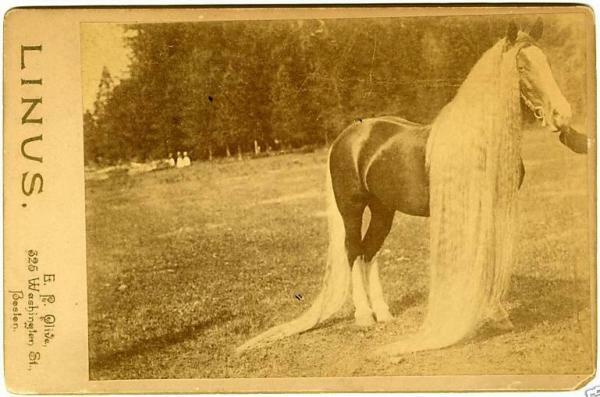 Born in 1884, Linus was a descendant of the breed known as the Oregon Long-Haired Wild Wonder horses, a herd that roamed freely throughout the mountains of Oregon. The wonder horses were known for their rich chestnut color and more importantly, the amazing lengths of their mane and tails. And, after having been bred primarily in captivity, the growth of their hair increased with each generation. But no one was more renowned for their glorious mane than Linus, who was dubbed the Samson among equines.